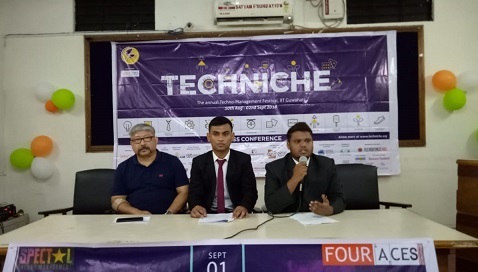 In a bid to uplift technology aspects in the Northeast, the Indian Institute of Technology, Guwahati (IIT-G) is all set to organise the 20th edition of the annual techno-management festival – Techniche 2018 at the IIT-G premises. The event will start on August 30 and continue till September 2, 2018. Around 50 educational institutions and 20 schools would participate in the event. Indian Army and Indian Air Force personnel would display the application of technology in defence. The convener of Techniche 2018, Purvish Shah, addressing the media here on Monday informed that the winners of Technothlon, a creative competition based on technology, would be provided an opportunity to visit NASA and the runners-up would be provided opportunity to visit ISRO. Shah also said that the objective of the event is to provide learning opportunities to the students. “The Techniche, being one of the largest technical festival in India, tries to give a fillip to the Northeast India in the world platform of technology,” Konwar said. Akash Shanker, media head of the event, informed that the IIT-G would also organise the 10th edition of Guwahati half marathon on August 26 as part of the Techniche 2018. ‘Run for Digital India’ is the theme of the marathon. Dr Manfred Krammer, head of the department of Experimental Physics, CERN and Marlon West, CEO and MD, Aviva India will deliver speeches as a part of the Industrial Conclave during the event.